The books I turn to most often, in my library, are collections of designs. In the first read through a new book of designs it is a matter of pure entertainment, as I turn each page with anticipation of what the designer will have come up with next, but over time I am more apt to study the designs over and over in detail, perhaps with a particular problem in mind each time. There are few really new problems to be solved in yacht design, but practically no problems have been solved so completely or with such excellence that they need not be revisited over and over in search of further progress. Different combinations of requirements generate (or probably should generate) completely different designs. An experienced eye can look at a hundred-year-old design, note it’s peculiarities, and pretty well know why the designer went down that road, whether one agrees with his decisions or not. The problems faced are evident in the solutions chosen. The process of refinement, or at least the attempt at refinement, is much of what is most fascinating to me about Yacht Design. It is a small, historically young, and esoteric field. There is plenty of room for innovation in every aspect of it, large and small, and there is potential for the smallest innovations to have a great impact. Many designers are employed making yachts complicated and expensive in the search for ever more impressive size, looks and luxury. More power to them, but here at Fore and Aft that is not really what we’re all about, so you won’t see much about that type of thing here. A few designers are engaged in the pursuit of ingenious simplicity, attainability, and an emotional bond between boat and owner. Nothing interests us as much as this pursuit. Phil Bolger was one of these designers, and was undoubtedly the most widely-studied and influential designer of his generation, in terms of those goals. 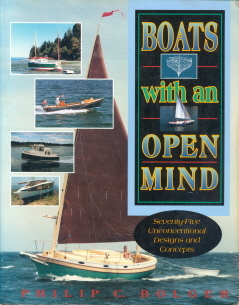 Bolger has done more to advance, broaden, and refine small boat design than anyone else. Some people in the boatbuilding industry are apt to look down on Bolger’s work. They talk about “Bolger boxes” as though the search for maximum utility at minimum cost was not a worthy goal, and might be just a little crazy. They are in boatbuilding because they appreciate tradition, nostalgic beauty, and skilled craftsmanship--there’s nothing wrong with that and nothing new about opinionated boatbuilders! Nobody appreciates those fine things any more than we do, but there are other reasons to have boats and to build boats, and most of those are just as legitimate. Part of the fascination of Bolger’s work is his complete dedication to the goals set by his clients. For Bolger every design was started as a blank piece of paper containing no preconceptions other than the wisdom of experience. If you don’t know the client’s requirements you can’t really judge a design. As the owner’s requirements are revealed in Bolger’s writing, the design he’s writing about usually begins to make sense. And we note that when he was asked to make beauty a priority, Bolger could do that as well as anyone, and better than most, and he could do it in both traditional and non-traditional ways. With so many truly fine designs already drawn and available for use, there is little point in commissioning a new design unless one cannot find what one wants in an existing design. In terms of pure beauty there are many existing designs which seem impossible to improve upon. If, for instance, I wanted an exceptionally beautiful 42’ gaff rigged schooner I think I would just build an Alden Malabar II and be done with it. But in terms of small cruising boats that can be easily built by their owners, and which are well-adapted to specific local cruising grounds, there is surprisingly little good work out there if you subtract Phil Bolger’s designs. Perhaps it would be better to say accessible good work. There are more good designs around if you can find them and understand them. Bolger was one of those exceptional designers who could write evocatively about the boats he drew. William Atkin, L. Francis Herreshoff, and my brother Tom MacNaughton are some others, and it is notable that all these men had and have enduring global followings as a result. Being able to explain what is great about a design in both practical and emotional terms makes those designs accessible to people in a way that a design which is simply available cannot. We note that there are Herreshoff Rozinante’s built new, year after year, decades after the design came out. A specialized design intended for oar and sail, she is a masterpiece but she is expensive for her accommodations and is almost always built with an engine and never rowed—her designer would have drawn a different boat for that usage. She would surely not be built in such quantities were it not for her designer’s essay about the design, which we feel is one of the best and most evocative design commentaries ever written. Bolger’s writing is of the same ilk, and to me it is highly evident that having read about the designer’s intent and reasoning, most people get more out of owning the boats. Bolger has a slight edge on some of his predecessors in the sense that he is pretty good at defining in his writing who should NOT own a particular boat, as well as who should. Bolger is famous for his plywood designs, which have made boatbuilders out of countless amateurs who would never have tackled such a project were it not for his simplification of the process. Most of the activity in boatbuilding these days seems to be at the top end of the market, and in small owner-built boats, often built to Bolger’s plans. This grass-roots boatbuilding has done a great deal to stimulate the wooden boat field in particular, and boating in general. Part of the reason for this is obviously the low cost of building these types of boats, but a word of caution is warranted. A boat’s true cost to her owner is not really known until she is sold someday, and it is just a fact of life that unusual looking boats made out of plywood and plainly finished are not going to fetch anything like the price of a more traditional boat whose appeal can be easily recognized by the average person. This is not to say that the non-traditional boats should not be built—far from it—but it is a factor that should be figured in, when making decisions. I own a Bolger Cartopper dinghy. I’m very happy with it, and I think it is a great looking boat. There are many other Bolger designs I would be very happy to own, but so far I can’t warm up to the boxiest of those designs where he has pretty much sacrificed all aesthetic considerations in favor of other priorities. I like both traditional and non-traditional boats, and I own and love another, rather radical boat which many people think is not good looking, but I have to be stirred by the looks of a design or I can’t own it—a boat needs to sing to me a little bit, at least. So while I love certain Bolger designs there are others which are interesting to me primarily as intellectual exercises and sources of great ideas. This is all subjective, of course. This book contains a wide range of fascinating designs, ranging from the 5’6” Breakdown Punt (which I think is a wonderful name) to a 95’ Pacific trading sharpie. My favorite of them is Bright Thread, a 26’ shoal draft, raised deck, round-bilged cat yawl. I think she is proof of Bolger’s ability to create really good looking boats that hark to tradition, while she is also, in fact, a quite non-traditional boat. With her clipper bow, strong sheer, artful moldings, elliptical ports and harmonious, expressive lines she seems like a nice example of a local historic working watercraft, converted to a yacht, but she is just Bolger’s response to a specific owner’s requirements. She is unusual in a number of features, such as her offset mizzen, unusually high freeboard aft (her best feature in my opinion), very shoal draft, unstayed cat yawl rig, clipper bow (which provides only decoration and an anchor handling bowsprit, not a terminus for the headstay), and her sheer treatment, in which there is above the “official” sheer first a pair of moldings suggesting a bulwark and above that another molding that includes the line of the raised deck. Both of these aesthetic devices are used to lower the apparent height of the topsides and to add visual interest, but I don’t recall seeing them used together, before Bright Thread. Our thinking parallels Phil Bolger’s in most things. In one area we take a more conservative line, and that is in the matter of draft, in boats intended for offshore voyaging. We hold to the idea that for offshore use a yacht ought to be reliably self-righting from an inverted position. This requires a certain amount of draft and ballast, and in a simple boat precludes anything we would call shoal draft. Lifting ballast keels can be designed, but their expense and complication is such that we don’t usually advocate them, and probably neither would Bolger have done so. Inversions do happen, and self-righting yachts often survive them. Bolger is more tolerant of shoal draft for offshore work, presumably in the belief that an inversion is unlikely enough to be discounted, and taking account of the many shoal draft, non-self-righting yachts that have made successful offshore voyages. There is always logic in playing the odds—we all do it every day or we wouldn’t leave the house—but in our own work and our own yachts we draw the line closer to a sure bet if for no other reason than to eliminate a worry when we can. I pretty much automatically acquire design collection books whenever I can, and I recommend that all boat enthusiasts do the same—there is so much to learn from designers who write. None is more entertaining or thought-provoking than Phil Bolger, so I strongly recommend this book along with his others.